Prepare your backgrounds by cutting or tearing pages from an old book and gluing a sheet of tracing paper on top. If your little artist is mature enough, they can help with this step. Lay the book pages, covered with tracing paper, in front of your little artist with all the mark making tools nearby. Encourage your little artist to fill the page with color. Look together for areas where the words show through the marks they make. What letters can they find under their painting? Does their picture tell a story? You only need a little glue to hold the tracing paper to the book pages. Run the glue stick around the edges of the book page and press the tracing paper down on top. You can use any book pages for this project. I asked my local bookstore for advanced copies that the publisher provides which cannot be sold because of editing flaws – they were happy to give me a couple free of charge. You can also pick something up at a thrift store or off your own bookshelf. 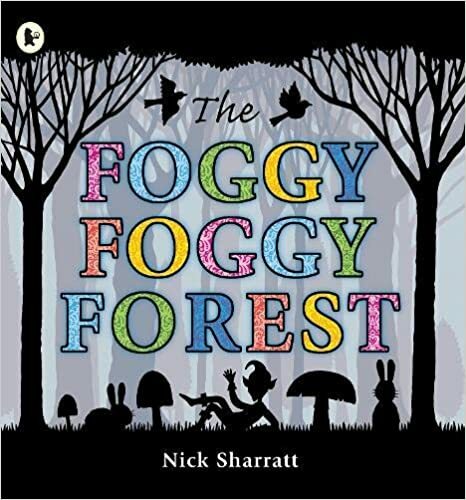 Before or after your drawing on pages project, read the book The Foggy, Foggy, Forest by Nick Sharratt together with your little artist.